For most people, January is pretty quiet. You might be drinking less so you maybe cut down on socialising, when the booze might get tempting. You might be eating more healthily after Christmas indulgence so you don’t go out for meals. The weather is nasty and the evenings long and dark, so walks and other outdoor activities are kept to a minimum. Which makes it a great time for catching up on reading books and watching films. On the other hand, January is also traditionally time for a fresh start: a new exercise regime, a new project at work, an honest look at all those DIY projects that need finishing. Which isn’t so good for the ol’ leisure time. New bookcase – ready and waiting. Happy New Year! For 2016 I have set my Goodreads challenge to 80 books (I don’t really use it as a target so much as a counter to check against my spreadsheet. Last year I was somehow 6 books out, so I either read 85 books or 91. Or maybe a number inbetween!). I have already made a good start on my primary aim to reduce my TBR by giving it a good old clearout. For my birthday my Dad bought me a set of shelves for the master bedroom, which gave me the perfect opportunity to collect my unread books from the spare room and give them a thorough sorting before re-shelving them in their new home. I thought I would struggle to discard any of my books so I gave myself the rule that I would remove anything I’ve had for more than 10 years. I’m not sure if I quite stuck to that but I actually found it fairly easy to set aside no less than 35 books! These are mostly older classics, with a handful of freebies and other books I’ve tried once and decided not to give a second chance to. I hope you are all having wonderful Christmases/end-of-year breaks. It’s still unseasonably warm and our time with family was brief, but it’s been lovely. We had a big family party at my Grandad’s yesterday for the first time in years and it was just like the Boxing Days of my childhood – completely wonderful. Did you get any good presents for Christmas? I got the usual mix of DVDs, CDs, chocolate and random awesomeness, such as a diary stuffed with tickets for awesome events throughout 2016 (Tim’s pretty great at gift-giving). And of course, as usual, I got lots of books. I love getting new books, always. I saw this chart in a few places today and just had to blog about it. As Improbable Research explains, this was put together as research for a new play, The Complete Deaths, produced by Spymonkey, in which all 74 deaths in Shakespeare are re-enacted. I’m envisioning something like the Reduced Shakespeare Company, who are always hilarious, so I’m pretty sure I want to see this play. But I’m also thoroughly enjoying the above chart and trying to remember which plays which deaths belong to! Who doesn’t love the stage direction “Exit, pursued by a bear” from The Winter’s Tale? I have been trying fairly hard not to acquire new books as my TBR persists in being more than 130 books. But the fact that its size persists goes to show that I’m not succeeding very well in my aim! It possibly doesn’t help that I subscribe to two publishers and I still borrow books from family and friends. This week I gained three new books. Martin John by Anakana Schofield is the first book in my 2016 subscription to And Other Stories. 100 Poems by Jen Campbell was a reward for supporting Jen in a charity fundraiser. The Man I Became by Peter Verhelst is the first book in my 2016 subscription to Peirene Press. They all look awesome and I can’t wait to read them. When I was a teenager, I forget which year, for my birthday I asked for money and a trip to Hay-on-Wye. 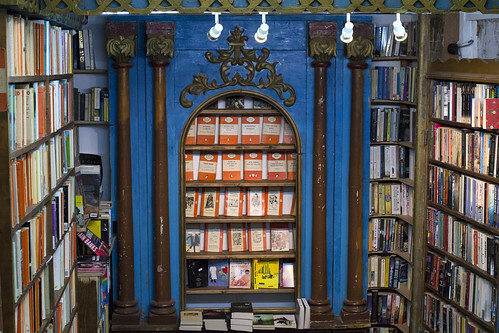 For those unfamiliar with it, Hay-on-Wye is a small town in Wales that’s very pretty, surrounded by lovely walking country, but most importantly it’s full of bookshops – about two dozen of them in fact. It’s pretty awesome and that was my favourite birthday treat ever. So this year when a friend invited me to spend Easter weekend in the Brecon Beacons, including Sunday in Hay-on-Wye, I obviously said yes. Shiny New Books is one year old! A very quick post to congratulate the team behind Shiny New Books who have just published their fifth edition of book reviews, author interviews and essays, marking one year since the website launched. If you haven’t yet checked them out, I do recommend taking a look and subscribing to their excellent newsletter, which has the admirable aim of bringing great new books to people who don’t know what to read next. I should add that I have contributed to the latest edition, by writing a review of White Hunger by Aki Ollikainen. If you’re interested in what I thought of this Finnish novella about a harsh winter in the 19th century, do check out my review. And while you’re there take a look at the rest of the content in the Spring 2015 edition. How were your Christmas and New Years, folks? I didn’t do very much reading, considering I had two whole weeks off work, but I did do plenty of relaxing, catching up with friends and family, and even some useful stuff. Not bad for someone who’s been gorging on cold and flu drugs for a week and a half. But then I love Christmas and birthdays (which I also had one of this week) so maybe I’ve been running on a bit of a high. More relevant to this blog than my sinuses or holiday cheer is all the many lovely books I have gained in the past fortnight. Not that I need more, but they’re still the best present ever. I can’t wait to break into these piles of deliciousness (actually, I’ve already read two of them, but one’s a joke book so that doesn’t really count).